Just kidding, I’m not getting married in a church, so there are no bells involved. But the rest is true: by the time you read this, I’ll be walking down the aisle towards the next chapter of my life, and to be perfectly honest, I can’t bloody wait for it anymore because I’ve planning it for so long now! There are big changes coming ahead: I’m moving jobs and moving across the country (back to the Big Smoke), but I’m marrying my absolute best friend here in bonnie Scotland first. It’s been a tumultuous year leading up to this point. And of course it didn’t really happen if you didn’t celebrate it with cake. Can I tell you a secret? I’m sick to death of this cake. I never want to bake it again. I’ve been through so many trials that I just want it to turn out perfectly on the day so I can finally enjoy it, and then I never want to hear about this cake again. 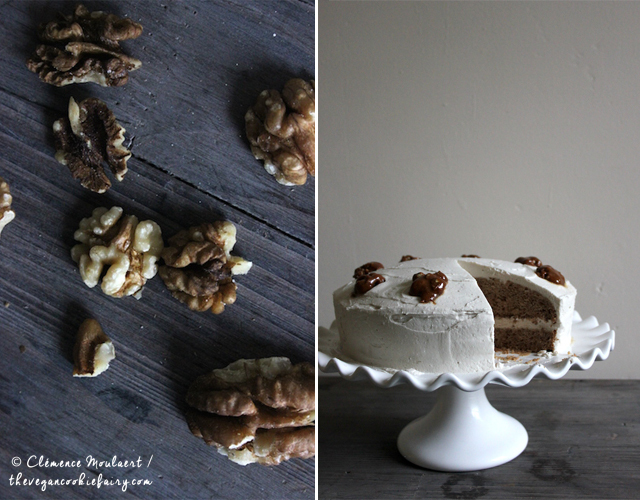 I was trying to make a chocolate hazelnut layer cake recipe from scratch when I already had one on the blog. Cue me yelling to myself: WHY ARE YOU TRYING TO REINVENT THE WHEEL, CLEM?! I dusted off the ol’ recipe and doubled it up to make the layers. 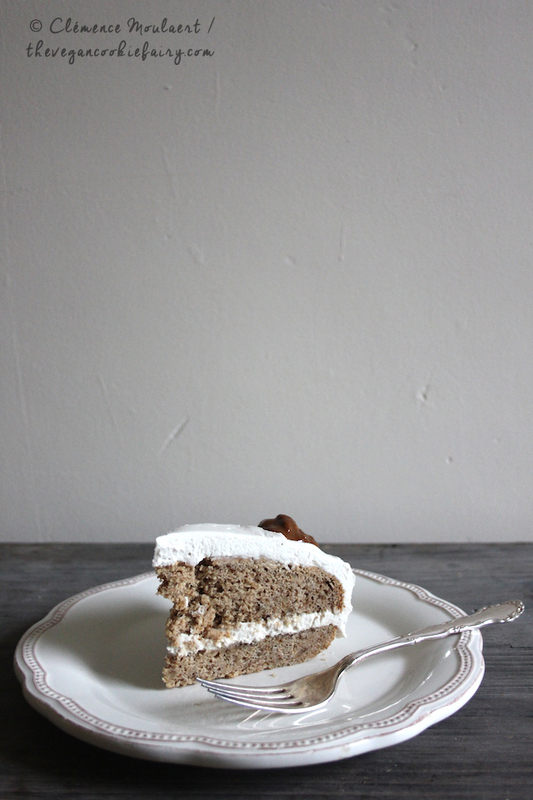 I’d forgotten how good this cake tastes – soooo hazelnutty, so damn good. I wanted it to look like a proper layer cake with buttercream icing though so while I kept the recipe for the cake layers the same, the whole thing is a very different to the original. And yes, while I’m very proud that I did this, if you asked me… no I would never, ever do this again. WHAT A BLOODY STUPID THING TO STRESS YOURSELF OUT LIKE THIS BEFORE YOUR WEDDING. But the stress is over now. I’ve got my pretty dress on, a glass of bubbly in my hand, and my best friend waiting at the end of that aisle. Cheers to that. Note: this is based on my recipe for Boozy Hazelnut Chocolate Cake. For the cake layers, you basically want to make the recipe twice. Don’t double it. I’ve tried and honestly if you haven’t got some kind of industrial kitchen mixer there’s just too much batter to handle at once, so it’s easiest and safest to make the recipe ones, put two layers in the oven, and then do it again. Up to you if you want four layers or just three. Three is about all I can fit in my travel cake tin, so that’s what I went for, but you could go bigger. The cake layers freeze very well. I made the layers at home, froze them, then took them with me to my Airbnb and assembled the cake there before taking it to my wedding. Pre-heat your oven to 180ºC/gas mark 5/350ºF. Start by baking the cake layers. Line and grease 2x 20cm springform or loose bottom tins. Prepare the cake batter as per the recipe linked above, then divide the batter equally between the two tins. Bake for about 40 minutes. Meanwhile, prepare the icing. Start by melting the chocolate and hazelnut milk in a small saucepan over low heat. Stir lots to prevent the chocolate from burning. Using an electric whisk, whisk the margarine and the melted chocolate together, then progressively add the icing sugar until totally incorporated. You should now have a smooth icing. Place in the fridge till needed. When you have the first two cakes ready, let them cool and then release from the tins. Clean, line and grease your tins again. Time for round two: make the same recipe again, divide between the two tins, bake again. When 3-4 cakes have completely cooled, level them if needed (I rarely do). Place the first layer on your prettiest cake stand, spread some hazelnut chocolate paste over it then about 1/5 of the buttercream. Smooth out a thick layer, then place cake layer number 2 on top of this. Repeat the same with the hazelnut chocolate paste and buttercream. And so on. I don’t usually put hazelnut chocolate spread on the top layer but don’t let me stop you. Use the rest of the buttercream to spread over the sides and top of the cake. Using a cake spatula, make the icing as even and smooth as possible (it’s not that different from plastering). Place the cake in the fridge while you prepare the chocolate drip. The cake should be very cold by the time you drizzle the melted chocolate over it, so that it can grip onto the buttercream and set quickly (otherwise it will drip too far down). The drip needs to be liquid enough to fall down the sides in elegant drips, but not so thin that it will run to the bottom and leave a thin layer over the cake. Melt the chocolate in the Frangelico and hazelnut milk in a small saucepan over low heat. Stir lots to prevent the chocolate from burning. Set aside to cool when there are no more lumps. Keep an eye on it and keep stirring it every so often: it should be running, not gloopy, but it should also hold on to a wooden spoon just a little; if it runs off like water, it’s not set yet, or you’ve added too much liquid. Once it’s the right consistency, slowly drizzle onto the centre of the top of the cake. It should pool in the centre and start spreading to the sides, and eventually drip over. You can also help spreading with a spatula or wooden spoon. Dust with ground hazelnuts. 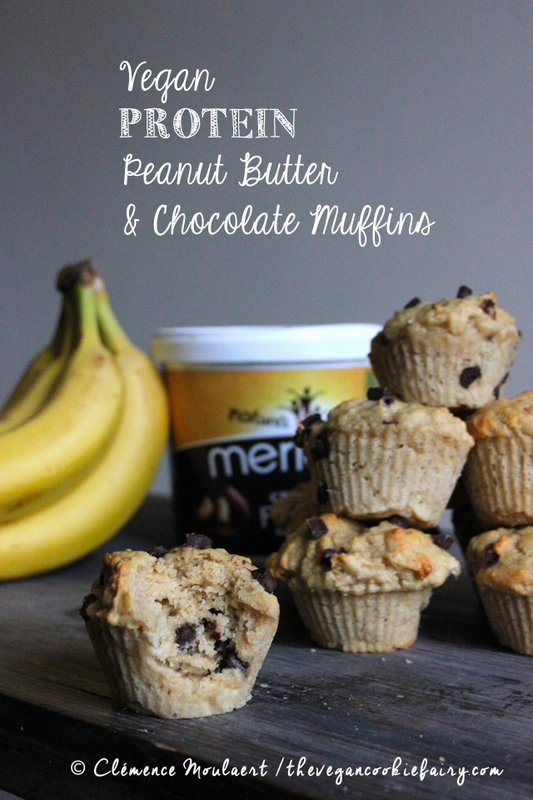 Place in the fridge to set, and serve when ready! Eat within 2 days and keep refrigerated. I did something very very exciting last weekend: I packed my bags and off I went to Glasgow, to spend all my hard-earned money on vegan cheese and chocolates at VegFest Scotland. Actually, I did another very exciting thing: I made this vegan Pumpkin Spiced French Toast for brunch, but more on that later. We’ve been waiting about a year for VegFest to come to Scotland, and finally the weekend happened. I went up to Glasgow on Sunday 6 (St Nicholas Day! Sampling all the chocolate to honour that tradition, eh), as I sadly couldn’t make it on the Saturday. I came prepared with a wee plan of talks I wanted to attend and stalls I wanted to visit. First up on my list: The Vegan Kind stall. You guys know I’m a big fan of this Glasgow-born and based company. Karris has done a fabulous job starting this business from the ground up, with the intention of making vegan brands more accessible to the general public and simultaneously supporting animal charities. I can’t think of a better business model than that. The reason I made their stall my first pit stop is because I knew they were fast selling out of their chocolate-filled Christmas selection box. It was filled (emphasis on was because I’ve nearly eaten the whole thing already) with chocolate bars from Vego, iChoc, Almighty Foods and Sarelle, all quality vegan chocolates that taste like milk chocolate – only £8! Next I hurried to Patrik Baboumian‘s talk on veganism and weightlifting. Having recently started lifting weights myself, I’m interested in finding out more about the proper plant-based nutrition to help my performance, so I was hoping to get some insights from Germany’s Strongest Man, but mostly I was charmed by his cheerful, endearing personality. He’s just adorable! His story is one of compassion and determination; he went vegan for the animals, and to his surprise found that his new diet was not only helping the world but also his performance. He got me thinking about how plant power can enhance my performance at the gym, and I’m considering buying his book to find out more now. The talk ended and I was free to roam and sample. I spent at least twenty minutes by the Almighty Foods stand, sampling the wonderful results of their superfood chocolate alchemy (THAT SPROUTED CHOCOLATE HAZELNUT FUJ, THO)(and the coffee chocolate bar!!) and emptying the contents of my wallet into their till. Tyne Chease was another must-have on my list. I missed these guys at the Edinburgh Vegan Festival in August but this time, I got my wish: a pretty little wheel of 100% organic smokey paprika “cheese”. It’s so moreish, but I have to make it last considering the price! I then wandered around, wondering what to spend the meager remains of my budget on. I debated between all the takeaway food stalls but ended up going for an old favourite, Henderson’s of Edinburgh (loyal to the core, what can I say), who served a mean Buddha Box and mince pies. I sipped on my Pink Russian cold-pressed raw drink from Glasgow-based (but hopefully coming soon to Edinburgh!) Juice Warrior, from whom I also bought a tote bag to carry around my purchases. I have to say I was disappointed by one thing: there was no recycling bin to throw away my cardboard food box in once I was done with my lunch. Bit of a bummer, SECC. I concluded the afternoon with Fat Gay Vegan’s talk for bloggers. I can’t say that I learned anything new there (I have been blogging for five years now) but I’d never met him in person, and just kind of wanted to bask in his positive presence. He’s a funny guy, and has some strong opinions that he stands by in a civil, sort of typically British way. Can’t help but like him for that. There was so much more to see and do and buy, but I just didn’t have the time. I’m surprised I didn’t get whiplashing from turning my head left and right all day, trying to decide which stall to visit next. From clothing to artisan chocolates to handmade cleaning products to kitchen utensil demos to freshly made food – there was just. so. much. I’m really excited about next year – hopefully it’ll be even bigger and better! It was definitely worth a trip to Glasgow to see my favourite vegan brands and discover new ones. I was there mostly for the food (I’m not even going to pretend otherwise) but there were also lots of talks and workshops, and extensive list of which you’ll find on the website. It’s best to show up with an idea of what you want to see so you don’t get overwhelmed. Or just turn up and go with the flow. Whatever floats your eco-friendly bamboo-made boat, I guess. My final recommendation: though you’ll eat plenty at VegFest, make sure you get in a hearty breakfast like this vegan Pumpkin Spiced French Toast. 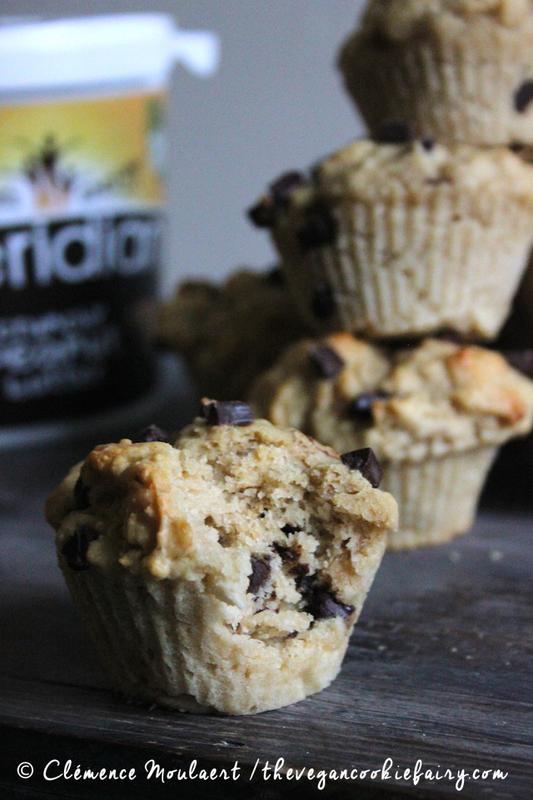 This week, I’m proposing a recipe that nourishes the soul a little more than the body… though I did do an intense Body Balance workout sesh right after I gobbled down a double portion of this breakfast recipe. Clearly it got me through the workout. When I was little, my mum and dad bought a campervan. It was a massive thing and we packed in the whole family – kids, dogs and all – to go on spontaneous weekend trips and summer holidays to the north of France. The Nord-Pas-de-Calais was one region we visited particularly frequently. As for the rest of our holiday hangouts, I can only say that I was just a wee girl at the time, and didn’t particularly pay attention to or care where we going. All I knew was that we were near the sea, the beach, and great places to eat. It’s funny, the older you get the less you remember complete events; I just have flashes of Dad knee-deep in the sand, digging a fort for us, a statue of Joan of Arc in a tiny village, my sister and I singing silly songs in the campervan until Mum couldn’t stand us anymore, our dog, Mimi, sat between us on the bench seat, and all the crêpes Mikado I ate on those holidays. 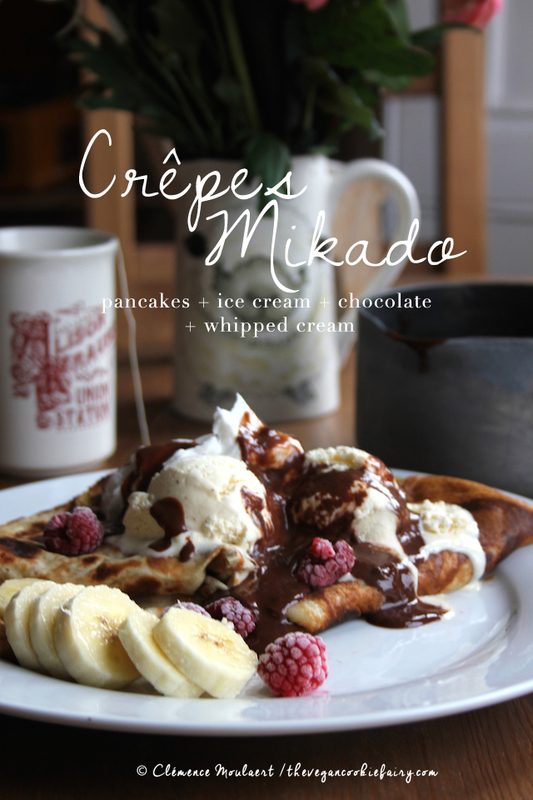 Some recipes for crêpes Mikado I’ve seen call for the making of a crème pâtissière, some even for frangipane cream. 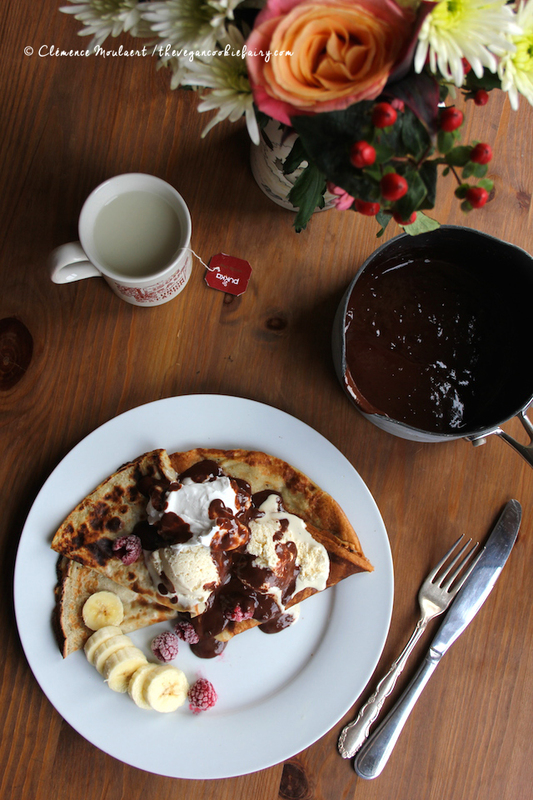 But the way I remember it, you need 4 simple ingredients: crêpes, vanilla ice cream, whipped cream and hot chocolate sauce. If you couldn’t be bothered with the chilling and whipping of the coconut cream – or just don’t like coconut cream – you can skip it or add an extra scoop of vanilla ice cream. In a blender, blend the ingredients for the crêpes, minus the butter/coconut oil, until smooth. Grease a large, shallow frying pan and place it on moderately high heat. Pour in half of the batter and swirl the pan so the batter covers its whole surface. You can also use a crepe spreader to do this. Cook the crepe on one side for about 3 minutes. The sides should be easy to lift up with a spatula, and the crepe should move around freely when you gently shake the pan. 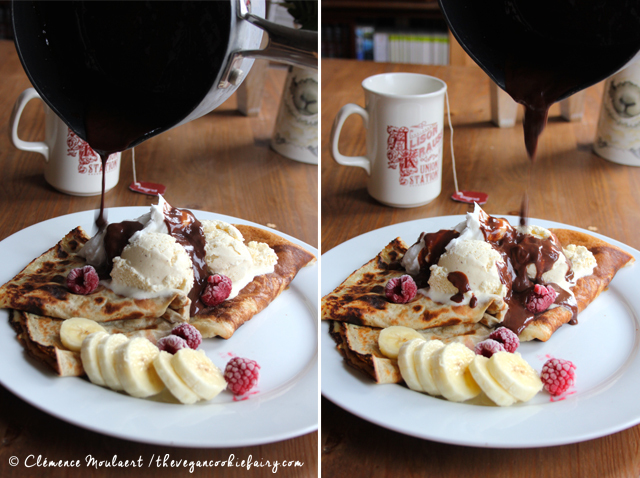 Flip the crepe with a deft swing of the wrist, or use a spatula if you’re not that confident. Cook on the other side for another couple of minutes. Place the crepe on a plate when it’s done, and repeat the process with the rest of the batter. For the toppings, start with the coconut cream, and make this ahead of time. Remove the upper, creamy part of the chilled coconut milk. Discard the watery part underneath. Whip the coconut cream with a little powdered sugar if desired. Melt the chocolate and 4 tablespoons soy milk in a small saucepan over medium heat. Stir with a wooden spoon to dissolve the chips. 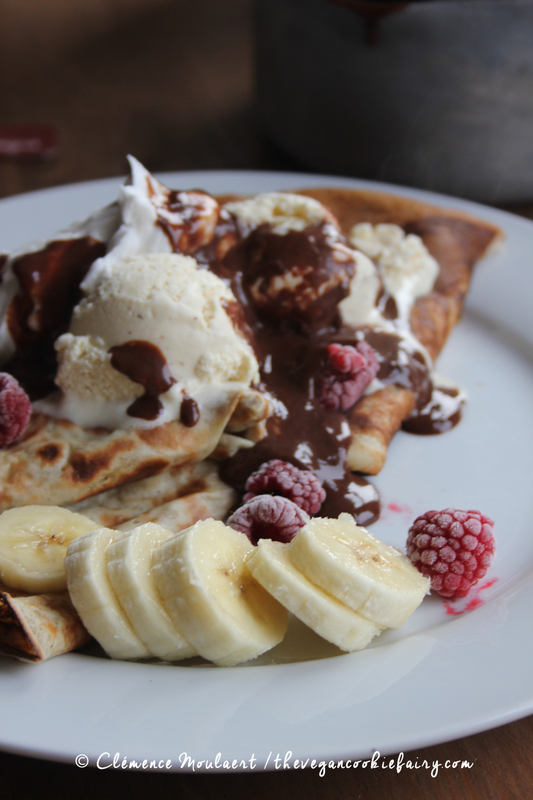 Place one scoop of ice cream over each crepe. 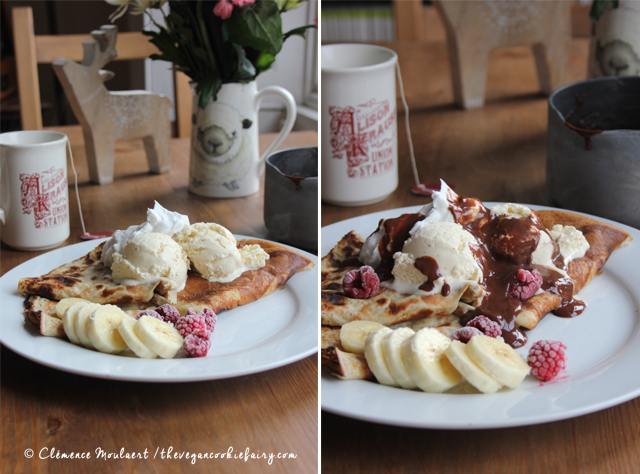 Top with a hefty dollop of coconut cream and drizzle over the hot chocolate sauce. Want more crêpes recipes? It say happens I am a fanatic an expert.